Some fleet drivers may not be fully aware of bad habits they’ve developed. GreenRoad not only provides real-time, in-vehicle feedback, it analyzes and translates risky driving events into a simple metric for each driver and the entire fleet. The lower the safety score, the better the driver. Easy-to-understand metrics are calculated based on safety events detected while on the road. Safety scores adjust in real time throughout each trip so drivers can make adjustments to their driving behavior and improve their safety score. Drivers can compare safety scores with teammates to inspire better driving. 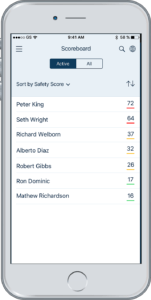 Managers can track safety scores by fleet, team, driver and vehicle. 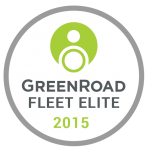 Each year, GreenRoad awards Fleet Elite status to drivers who have demonstrated sustained excellence in driving performance and safety. The Fleet Elite program inspires fleet drivers to act as models for their colleagues and provides them with a professional credential that will serve them throughout their career.